The Toyobaru twins were always seen as throwbacks to the days of old AE86s and the drifting manga that made them famous. 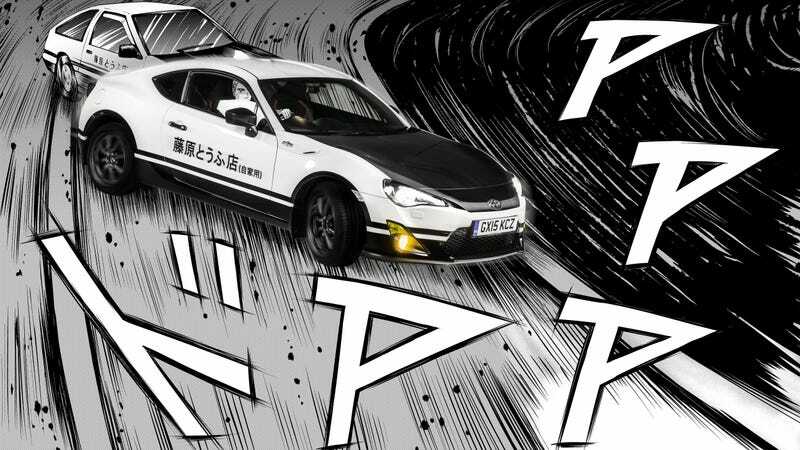 Now Toyota of the UK is completing the circle with an Initial D-tribute concept car. Of course you get the black and white paint scheme. Anybody can do that. There’s even an FR-S (RIP Scion) here in the northeast that runs rallycrosses and drift events in this livery. But it’s wild that an official branch of Toyota is making one of these, and it’s incredibly cool that they got some custom Watanabe wheels to get the look right. Also appropriate are the car’s Fujitsubo exhaust, TRD suspension, and Cibie-inspired yellow fog lights. The best part is the new concept uses carbon-fiber parts to match the ‘80s Corolla’s cheap plastic pieces. Let me correct myself; these illustrations that Toyota had done up sticking the car into the Initial D universe are really the best. It’s nice to see Toyota honoring the willful spirit of the past with this thing, and also giving us all opportunities to make tofu-delivering jokes for the rest of the day.